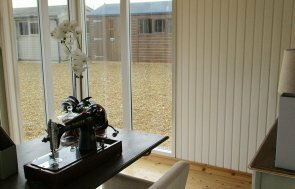 A Salthouse Studio can be a perfect building to use for a range of purposes, including an art studio, garden office, hobby room or even a garden retreat, and this customer is going to use theirs as a sewing room. The customer lives in sunny Derby, and the building has been installed at the bottom of her garden, giving a good view of the length of the garden, as well as her house. The size of the studio is 2.4 x 4.0m, with double doors and four windows at the front, all of which are made up of a full-length pane of glass to give an unhindered view of the garden, as well as to allow an abundance of natural light inside. All of the glass in this building is double glazed as well. Lizard, a green colour from our Valtti colour range, has been used to give the Salthouse a natural-looking, opaque finish. Black guttering has also been fitted onto the back to catch any rainwater that falls off the heavy duty felt on the roof. Internally, the customer chose natural matchboard lining on the walls and an electrical pack, and they also get full insulation, draught excluders, and two opening fanlight windows on the back wall to allow fresh air into the sewing room. 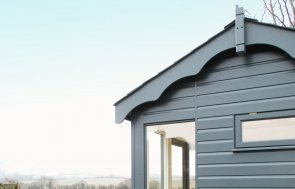 If you would like a hobby room, you may be interested in looking at the rest of our Garden Studio range, as well as even our Summerhouses or Garden Rooms. To obtain more information about our buildings, you can visit one of our show centres to see our range for yourself, or you can Contact Us or call us on 01760 444229.